The three-day lineup is headlined by big name acts Red Hot Chili Peppers, P!nk, Muse, plus Tom Petty & The Heartbreakers to close it out. Not too shabby right? I wanted to learn the ins and outs of this beachside entertainment event and how it stands out during festival season. Speaking with Jason Felts, Chief Brand and Marketing Officer of KAABOO, I discovered what it takes to put together a weekend long extravaganza, the amenities being offered like never before and some surprise teasers fans can look forward to. OC Weekly (Michael Silver): What are the origins of the festival and how did Del Mar become its home? Jason Felts: We began KAABOO three years ago after recognizing this white space in music festivals. We’ve set out to be a different festival then others with upscale amenities while attracting a more mature audience. It’s a great location at the Del Mar Racetrack that we’ve locked in for a 10-year lease. The venue is right next to the beach and it couldn’t be a better place to have an amazing three-day event. We’re catering to adults from 18 or 21 to 75. There are no port-a-potty’s on site for example. We have uniquely curated the weekend experience with world-class music, comedy, amazing cuisine, craft libations, arts and VIP treatment. Were shifting the paradigm and starting something new. Festival season is a very competitive industry in the U.S. What drew you into this event style organization? I wear two hats, as CEO of Virgin Produced and Chief Brand and Marketing Officer of KAABOO. Learning from the best entrepreneur, Richard Branson, led me into this direction. I love concerts and go to shows probably once a week, and 10-15 festivals per year so it was a seamless transition into the world of entertainment. Take me through the process of curating the lineup. How do you decide who is worthy of headlining each day and the supporting acts accordingly? We have a great team of talent bookers that have been doing this for many years. We look at our audiences and want to provide the biggest names in music from today’s global hit makers to headliners everyone will enjoy. We had Aerosmith last year, and it was their only U.S. date. This year we have Red Hot Chili Peppers, P!nk, and Tom Petty at the top of the bill. Offering a diverse lineup is the best part for music fans. The “Humor Me” stand-up comedy portion of the weekend has a unique group. Whose idea was it to incorporate this change of pace to the traditional music fest? The idea of taking a break from the music is great. Not everyone wants to stand for hours on end at a stage. Being able to enjoy an air-conditioned area and sit down, laugh, order drinks, and enjoy your surroundings really made us think this was worthwhile. Do you feel like you’re in direct competition with other music events around the country or is this a unique space of its own? No we’re not in competition because no one is doing a festival like ours. It’s unique on it’s own and in addition to the VIP cabanas and pool parties, who else is doing an all-night after party? Are there any concerns regarding party lifestyle drugs and how the younger generation partakes in the festival scene? It’s a great question, we have the best security staff around the country that also work in professional sports and are highly skilled. We don’t see our audience being the typical festivalgoer taking drugs, and we have our security make sure everyone is safe. Having a good experience is important but safety is our biggest priority. Can attendees expect any surprise performances or collaborations? I read that Shaquille O’Neal is doing a DJ set? I can’t give away any secrets in detail but I’m certain there will be some big name surprises in attendance. If you’ve never seen Shaq as a DJ he is amazing! I’m really excited for the return of Ke$ha. She was hidden for a while writing her new record and it’s doing huge numbers. She is tremendously talented and we’re excited for her to be playing at KAABOO with us this year. 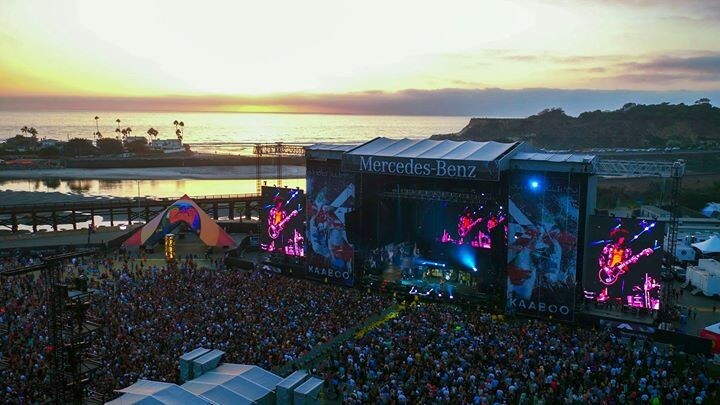 KAABOO Del Mar takes places September 15th – 17th at the Del Mar Racetrack + Fairgrounds in Southern California. Ticket information and packages can be found on the KAABOO website with daily time schedules and more details listed.